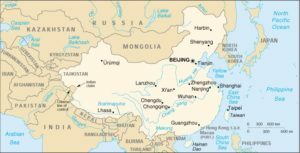 China is a developing country with a population of 1.28 billion people. It covers an area of 9.6 million square kilometres, which makes it the fourth largest country in the world, after Russia, Canada and the United States. Despite a population density of 133 people per square kilometre, nearly one-third of China is sparsely populated due to harsh geographical conditions. For this reason, universal telecommunications access for remote and less populated areas has been a challenge for both the government and telecommunication operators. Civil wars, foreign invasions and endless political movements since the beginning of the 20th century, have left China with an extremely fragile economy. This situation lasted until the end of the ten-year-long Cultural Revolution in the late 1970s. Since then, the Chinese government has taken a relentless stance in reforming its economic system, and has transformed the highly centralised planned economy into a so-called socialist market economy. An open-door policy has attracted substantial foreign direct investment in most industries except for telecommunications operation and other politically sensitive sectors. Economic reform efforts are proving effective and successful, and China has enjoyed two-digit economic growth rates in most years of the 1980s and 1990s. In 1998, China was removed from the World Bank’s low-income classification and placed into the lower-middle-level-income category. Basic economic and demographic indicators for China are listed in Table 1.1. Hong Kong became a Special Administrative Region (SAR) of China on 1 July 1997 after its handover to the Chinese Government by the United Kingdom. Under the regime of ‘one country, two systems’, Hong Kong SAR has independent financial, economic and legal systems. 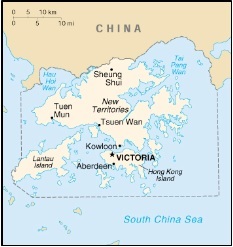 The total population of Hong Kong SAR is 6.72 million and its total area is 1,098 square kilometres. With 6,310 people per square kilometre, Hong Kong is one of the most densely populated territories in the world. Hong Kong is widely regarded as having one of the most free and competitive economies in the world. In November 2000, the Heritage Foundation ranked Hong Kong as the world’s most free economies for the seventh successive year. At the beginning of 2001, the 2000 Annual Report on the Economic Freedom of the World, led by Canada’s Fraser Institute, Cato and supported by more than 50 economic institutes world-wide, also ranked Hong Kong as the most free economy in the world. Over the past two decades, the Hong Kong economy has more than tripled in size. Hong Kong’s Gross Domestic Product (GDP) has been growing at an average annual growth rate of about 6 per cent in real terms, to US$163 billion in 2000. Per capita GDP in Hong Kong has more than doubled in real terms, equivalent to an average annual real growth rate of about 4 per cent. In 2000, it reached US$24,000. However, Hong Kong suffered seriously from the Asian financial crises during the period from late 1997 to early 1999. 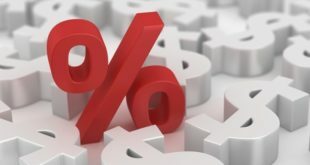 The property market dropped by almost 50 per cent while the unemployment rate jumped to 6.0% – the highest in 30 years. Since late 1999, Hong Kong has shown a momentum for recovery. The Hong Kong economy turned out a spectacular performance in 2000, with its GDP rendering a 10.5% growth in real terms over the previous year. Table 1.2 provides an overview of Hong Kong’s economic and demographic status. China’s telecommunications industry, like other industries, experienced sluggish development before the late 1970s. As a result, the teledensity was only 0.43% in 1980, almost the lowest among 140 leading countries. Furthermore, international telephone service was only available in a limited number of cities. Telecommunications was treated not as a commodity, but an instrument for government and military use. Given the poor economic returns from telecommunications services, the government had to take a policy of ‘subsidising telecommunications with postal service’. Both services were jointly operated by the former Ministry of Posts and Telecommunications, which was renamed as Ministry of Information Industry in 1998. When the Chinese government decided to reform its economic system in 1978, it soon realised that the poorly-developed telecommunications infrastructure had seriously deterred foreign investment and had acted as a bottleneck for domestic economic growth. To cope with this, the Chinese government granted several preferential policies to the Ministry of Posts and Telecommunications, giving priority to the development of telecommunications. These preferential policies included the ‘three 90%s’ policy: 90% of profit is retained by the local service provider (in other words, the tax rate is 10% for telecommunications, much less than the 55% tax rate for other industries); 90% of foreign exchange earnings are to be retained by the enterprise; and 90% of the central government’s investment is considered as un-repayable loans. In addition to these preferential policies, the Chinese government began to implement certain market schemes in the telecommunications sector at the beginning of the 1980s. The main areas of reform lay in the decentralisation of administrative power to lower government echelons, the development of market relations, the delegation of responsibility for performance to enterprise managers and the encouragement of incentive systems. Detailed schemes included the “Contractual Responsibility System”, which uses contracts to clarify responsibility for success and failure at all levels of the industrial hierarchy and then decentralises power to these levels accordingly. Directors of the provincial Posts and Telecommunications Administrations sign the contract with the governmental department annually. 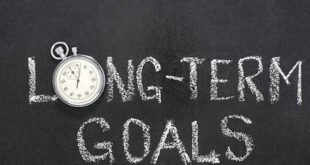 Through negotiation, objectives such as traffic, revenue, profits, quality and efficiency targets are contractually defined. Also quantified are the reward and penalty measures. Material rewards, which were not encouraged in the past, have been widely applied. In order to define the terms of the contract on profits precisely, an Economic Accounting System, which is similar to the international settlement scheme, has been used to reallocate revenues among all parties in the telecommunications process, so that the profit level, or economic performance, of each individual party can be measured properly. The above preferential policies and the successful implementation of reform schemes have effectively facilitated the development of telecommunications in China. China Telecom, the incumbent operator, currently owns the world’s second-largest fixed telephone network with a total capacity of 179.0 million mainlines (as of December 2000), while China Mobile owns the world’s second-largest mobilephone network, with a total capacity of 107.20 million (as of December2000). Figure 2.1 shows the exponential growth of the telephone penetration rate in China, including mobile service, since 1980. Telecommunications has not been subsidised by the postal service since the mid-1980s. To the contrary, profit from telecommunications has been used to subsidise the postal service, and in 1999, this cross subsidy reached 6.55 billion Yuan (ca. US$791 million). In 1994, the former Ministry of Posts and Telecommunications formally announced that the telecommunications infrastructure in China was finally able to satisfy the basic demand of the public and the economy. This was a critical turning point – the Chinese telecommunications market had turned from a sellers’ market into a buyers’ market. The Chinese government applauded this achievement, and, at the same time, accelerated its pace to transform the Chinese telecommunications sector into a market-orientated industry. Operational efficiency became more important, as the government clearly realised that the high growth of telecommunications in the past had mainly resulted from preferential policies and significant investment. 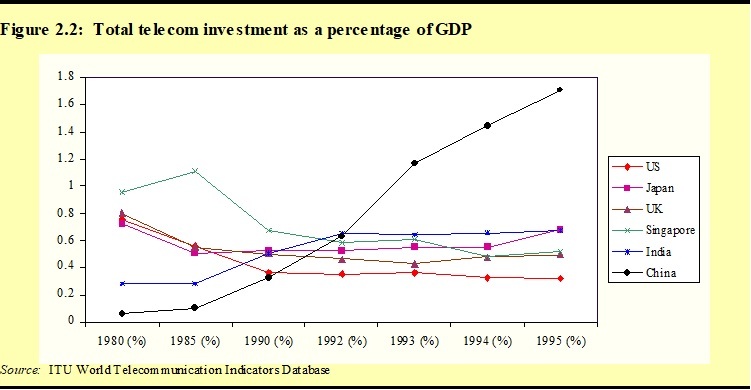 Figure 2.2 shows the total telecommunications investment as a percentage of overall GDP in selected countries. It clearly indicates that China has given an increasingly higher priority to public telecommunications investment since 1980, which has reached and surpassed investment levels in other major economies. To ease the transition from support-driven growth to market-driven growth, the Chinese government has gradually withdrawn the preferential policies once granted to the telecommunications sector, and opted to deregulate the telecommunications market. In 1993, the State Council agreed to a joint proposal from several influential ministries for the deregulation of the Chinese telecommunications market. In July 1994, a joint venture between shareholders from the Ministry of Electronic Industry (MEI), the Ministry of Railways (MOR), the Ministry of Electrical Power (MEP) and thirteen other giant state-owned companies, was formally established as China Unicom. The establishment of China Unicom provided these ministries with a gateway to enter this huge market. Most importantly, it heralded a process of discontinuity in telecommunications policy – a break with the traditional centralised monopoly model. However, experience has shown that the largest barrier for subscribers to fully explore the benefits of competition comes from an ineffective regulatory framework. In spite of the fact that China Telecom (once the Department of Directorate General of Telecommunications of the MPT) was still acting as the operational arm of the MPT, the State Council designated the MPT as the regulator for national telecommunications. To some extent, therefore, the MPT enjoyed dual status as both regulator and operator. This ineffective regulatory framework has put China Unicom at a significant competitive disadvantage, especially with respect to network interconnection. China Unicom and its shareholding ministries have since made strong appeals for the restructuring of the regulatory framework, namely for complete functional and organisational separation between China Telecom and the MPT. Furthermore, the increasingly rapid development of individual private networks, especially the cable network of the Ministry of Radio, Film and Television (MRFT), has raised governmental concern over ‘duplicative construction’. The main driving forces for the expansion of MRFT’s network are the high rental fees and notoriously poor quality of service provided by China Telecom. For example, it would cost 54 million Yuan (around US$6.5 million) for Shanghai Radio, Film and Television Bureau to lease network resources from China Telecom for a period of three years, while it would cost them only 20 million Yuan (US$2.4 million) to build a private optical network with the same coverage area . This type of economically unsound offer has been the main reason why the MRFT and other ministries were reluctant to co-operate with China Telecom. Consequently, the demand for private networks has grown. In April 1998, a new ministry, the Ministry of Information Industry (MII), was formally established. It was the result of the merger between the former Ministry of Posts and Telecommunications and the former Ministry of Electronic Industry. The MII is thus an extremely powerful ministry, and all networks and IT manufacturing industries are now subject to MII’s regulation. According to the State Council, MII’s main commitments include development strategy stipulation, policy-making and overall regulation of the information industry, including telecommunications, IT product manufacturing and the software sector. The establishment of the MII is undoubtedly a positive step towards further deregulation of the Chinese telecommunications market. The most revolutionary step taken by the MII since its establishment was to split the former China Telecom into four independent groups in mid-1999, namely China Telecom, China Mobile, China Satellite and Guo Xin Paging Company. Instead of following the approach of the United States when it divested AT&T and restructured the local network into seven regional Bell operating companies, the MII adopted a strategy of ‘vertical separation’ – that is to say, China Telecom was split up into four groups according to specific services. China Mobile is specifically dedicated to mobilephone services; China Satellite is specific in satellite communications while Guo Xin Paging Company focuses on radio paging services only. Both China Mobile and China Satellite are financially and operationally independent, and the government is hoping that they can provide other services and compete with other operators in the future. The Guo Xin Paging Company was subsequently merged with China Unicom as a measure to enhance China Unicom’s financial strengths. China Telecom remains responsible for both long distance services and local fixed network services. In other words, China Telecom still controls the fixed network for both local and long distance services. Hence this organisational restructuring of China Telecom is not a thorough revolution, as China Telecom still enjoys significant dominance in the fixed network, and the barriers to entry remain as high as they were before the restructuring. Currently, the Chinese government is in the process of conducting another round restructuring of China Telecom. Although the MII is still a governmental department, the operational functions of China Telecom have been separated from MII’s regulatory commitments. According to the State Council, China Telecom and other telecom companies are defined as part of the top 100 large-scale state-owned enterprises in China and are directly under the supervision of the Central Enterprise Working Committee (a newly-established governmental department that is specifically responsible for the administration of state-owned assets without directly intervening in each individual company’s routine operation). The MII currently enjoys a relatively neutral and independent status over telecommunications regulation because it no longer affiliates with any operators. This status has enabled the MII to take a more pro-competitive stance in facilitating competition in the Chinese telecommunication market. Since the establishment of MII, both China Netcom and China Railcom have obtained licences and begun to compete with other operators in all telecommunication sectors except mobile service. A highly competitive telecommunications market has emerged in China. Table 2.1 presents general statistics on the development of telecommunications infrastructure in China in recent years. Although Hong Kong has the most free economy in the world, local fixed service and international telephone service were monopoly services until 1995 and 1998 respectively, due to the exclusive franchises held by Cable & Wireless HKT (CWHKT), formerly known as Hong Kong Telecom. Compared with early mover countries, this was a very late starting point. However, the Hong Kong government and its regulatory agency – Office of Telecommunications Authority (OFTA) – have taken a strong and aggressive stance in promoting telecommunications deregulation. For instance, Hong Kong was the first region in the world to incorporate number portability into local fixed telephone service (July 1995) and the third region to provide number portability for mobile telephone service (March 1999). Currently, Hong Kong has one of the most sophisticated and competitive telecommunications markets in the world. Following the expiry of CWHKT’s monopoly over local fixed telephone services on 30 June 1995, four companies, namely CWHKT, New World Telephone Limited, New T&T Hong Kong Limited and Hutchison Communications Limited, were licensed to provide local fixed telecommunication services on a competitive basis. This has placed tremendous competitive pressure on the incumbent, and aggressive steps in strategy restructuring and service innovation by the CWHKT were witnessed in recent years. For example, CWHKT is the first operator in the world to have commercially launched Interactive TV (Video–On-Demand) service, and its broadband optical network now covers more than 95 per cent of households in Hong Kong. To further enhance competition in the local network, OFTA issued five fixed wireless local network licenses on 1 February 2000. At the same time, Hong Kong Cable Television Limited obtained its license for providing telecommunications services via its cable network. For mobile communications, the government followed a pro-competitive policy right from the beginning. By 1987, three licenses for analogue mobile service had been issued. In 1992, SmarTone obtained the fourth license and immediately began offering digital GSM service. In 1996, OFTA issued another six licenses for PCS service – the high-band GSM service, which triggered-off another round of fierce competition. After a period of mergers and alliances, there are now six mobile operators holding eleven licenses. With a population of only 6.72 million people, it may not be an exaggeration to claim that Hong Kong has the most competitive mobile market in the world. Figure 2.3 indicates the latest market share of these six operators, namely PCCW, Hutchison, New World, Peoples, SmarTone and Sunday (Mandarin). Although Hutchison and PCCW are the two leading operators in terms of market share, none of them is able to dominate the market due to the high subscriber churn that has been facilitated by mobile number portability. For the international telephone (IDD) market, CWHKT was granted a 25-year exclusive license for providing certain external telecommunication circuits and services in 1981. To fully explore the benefits of telecommunications deregulation, the Hong Kong SAR government reached an agreement with CWHKT in January 1998 regarding the early termination of CWHKT’s franchise relating to IDD service which is due to expire in 2006. According to this agreement, CWHKT surrendered its exclusive license on 31 March 1998 in exchange for compensation of HK$6.7 billion (ca. US$864 million) from the government. At the same time, the fixed telephone network service (FTNS) license held by CWHKT was amended to extend its scope to cover external fixed telecommunications services and circuits. Parallel amendments were made to the FTNS licenses held by the other three FTNS operators to allow them to provide non-exclusive external services starting on 1 January 1999 and non-exclusive external facilities starting on 1 January 2000. After two rounds of consultation, the Government announced in October 1998 its decision not to set a limit on the number of licenses for the operation of external telecommunications services (ETS) from 1 January 1999 onwards. By the end of April 2001, there were 201 licensees providing ETS. 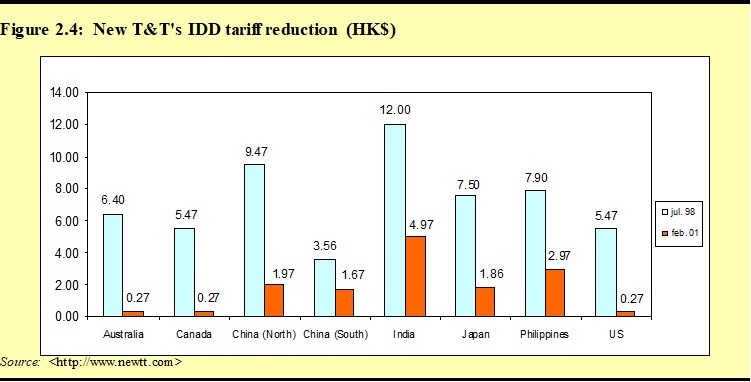 The liberalisation of the IDD market has brought immediate benefits to Hong Kong’s economy and public in terms of diversified choice and reduced prices. 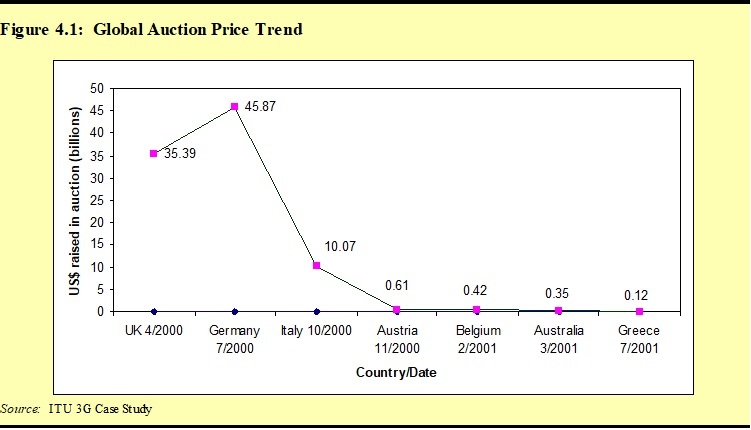 Figure 2.4 shows the dramatic IDD tariff reduction to major destinations during the period from July 1998 to February 2001 offered by New T&T. New T&T is one of the local fixed network service licensees, which used to provide IDD services prior to liberalisation, by way of call back. From 1 January 2000 all telecommunications services in Hong Kong have been completely liberalised in real terms. The early termination of the monopoly operation in the IDD market indicates that the Hong Kong SAR government has gone beyond its commitment to the WTO’s Basic Telecommunications Agreement. Table 2.2 presents selected data about the status of Hong Kong’s information infrastructure. In Hong Kong, all operators have been privately owned since 1981 when Cable & Wireless was privatised in the UK. In China, however, all telecom operators remain state-owned or state-controlled. Competition without privatisation has been a path adopted by the Chinese government within the constraints of its traditional centrally-planned economic system and Marxist ideological origins. In China, however, state ownership of major telecom operators lends ambiguity to the status of the central government, which is caught between the interests of two rival coalitions of interests. On the one hand, the government would like to achieve the benefits of competition by incorporating deregulatory mechanisms in the telecommunications sector. On the other hand, it has limited ambition to invest in the construction of extra networks. Unsurprisingly, in comparison with Hong Kong SAR, the Chinese Government has shown a little perseverance in implementing a deregulatory policy in the telecommunications sector. For instance, there are only two operators in this world’s second largest mobile phone market. In Hong Kong, foreign or external investment has not been subject to any restrictions. For the incumbent, Cable & Wireless HKT (CWHKT), the major shareholders have been Cable and Wireless plc, a British company, with 54 per cent ownership, and China Telecom, with approximately 11 per cent ownership; local and international investors have held the remaining shares. After the merger between CWHKT and Pacific Century CyberWorks (PCCW), Cable and Wireless holds 25 per cent of the shares of the new company. Among the new entrants, Hutchison has 26.7 per cent of its shares owned by NTTDoCoMo of Japan, while New World has 5 per cent of its shares owned by US West, a US regional Bell holding company. Due to the recognition that foreign direct investment is one of the most important financial resources for network upgrading and expansion, the Hong Kong government has adopted a policy on foreign direct investment that is open, transparent, pro-competitive and non-discriminatory. In China, foreign direct investment in telecommunications operation has been strictly banned. To solve the problem of financing the rapidly growing mobile market, the preferred model of the Chinese government was to set up branch companies of China Mobile and China Unicom in Hong Kong, namely China Mobile (HK) and China Unicom (HK). The state holds majority shares of this branch (around 75 per cent) and the rest (around 25 per cent) is listed on the stock markets of Hong Kong, New York and London. Subsequently, this branch re-invests or takes over the mobile networks in China while the operation is left to the hands of local Chinese operators. In this manner, the mobile company obtains sufficient funds and, at the same time, the operation is fully controlled by Chinese operators. The absence of pressure from foreign operators in the Chinese market enables the Chinese regulator to formulate the Chinese version of policy without the necessity to follow the approach that has been widely adopted by other countries. However, this situation is due to change when China’s becomes a member of the WTO. In Hong Kong, telecommunication policy has been formulated around the Telecommunications Ordinance. The regulator also issues statements covering specific aspects of telecommunications regulation. For example, Statement No. 7, issued on 10 June 1995, clearly outlined carrier-to-carrier charging principles. From this, operators understand which procedures they should follow. They can also defend their interests during the consultation stage of the policy-making process. In China, no legal document such as a Telecommunications Act exists. In the past, operators defended their interests by leveraging their individual strengths, without recourse to a transparent regulatory framework. A game without clear rules had seriously impeded the deregulation of the telecommunications market in China. A big step was taken by the government in September 2000 with the publication of Telecommunications Regulation – a prototype of Telecommunication Act. In 2001, the Chinese government placed the drafting of Telecommunication Act to its top priority and the first Telecommunications Act in China is expected to be passed by early 2002. In Hong Kong, the Telecommunications Branch of the Post Office was the regulator before the establishment of the Office of Telecommunications Authority (OFTA) on 1 July 1993. Due to the private and foreign ownership of telecommunications operators, this government department was able to stipulate policies in a relatively neutral way, despite the fact that it might be subject to political intervention due to its status as a government department. The establishment of OFTA marked the birth of a truly independent telecommunications regulatory agency. The Director-General of OFTA is directly appointed by the Chief Executive of Hong Kong SAR, which enables him or her to operate independently without being subject to intervention from other Government departments. Financially, OFTA is self-funded through license fees from operators, which shields it from political intervention in the form of budget controls. Also, OFTA staff are banned from holding shares in any telecommunications company (this includes mutual funds consisting of such shares). This guarantees that regulation can be implemented in a fair and unbiased manner. In China, however, the incumbent operator was closely affiliated with the regulator before 1999. 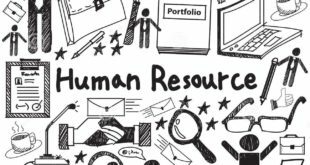 In the absence of a legal framework and clear policy guidelines, new entrants have been treated unfavourably and there has been a form of ‘regulatory discrimination’. The establishment of the Ministry of Information Industry marked a significant leap forward to the independent status of the regulator. Although the state ownership has inferred the stance of the regulator to take a full-blown pro-competitive policy, the separation of operational function from that of regulation fits the requirement of the WTO, as the MII is no longer affiliated to any operators. This has provided a level playing field for all operators. The comparisons above indicate that regulatory frameworks in China and Hong Kong SAR have contrasting economic philosophies and political ideologies. Consequently, regulators in these two economies have taken different policy approaches to enhance the development of telecommunications. Not surprisingly, the economic considerations underlying 3G licensing policy in the two economies, which will be highlighted in subsequent chapters of this study, differ remarkably. Mobile services have been available in China since 1987. On 18 November, the Guangzhou Exchange, China’s first cellular exchange, opened with a subscriber base of 150. It had 3 base stations and 40 channels. The incumbent operator, namely the former Ministry of Posts and Telecommunications (MPT), was the sole provider of mobile services. Due to ineffective co-ordination, there was no unified single standard and individual provincial Posts and Telecommunications Administrations were obliged to import different systems from different vendors in different countries. Consequently, and not unlike the situation in the European mobile market of the 1980s, a phenomenon emerged known as “seven countries, eight systems”. This created many technical problems and huge extra costs when nationwide roaming services were first made available in the early 1990s. The heavy and clumsy analogue handset soon became a symbol of wealth and status due to high handset prices and service charges. 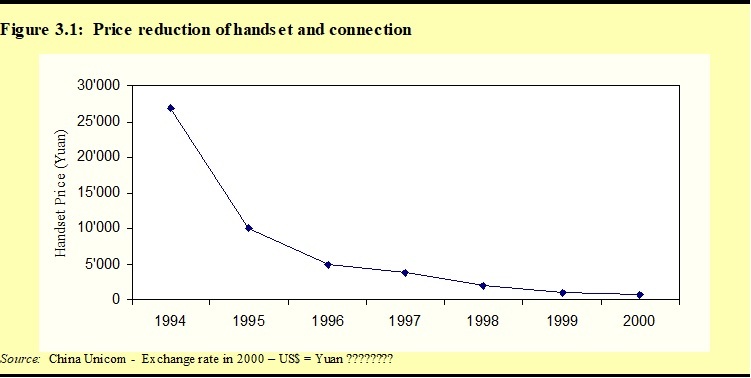 In 1992, in order to purchase a handset from the operator (there was no other choice) and get connected, users incurred costs amounting to 25,000 Yuan or US$4,300, which was equivalent to fourteen times the GDP per capita in the same year. Only businessmen of private and foreign corporations were able to afford mobile services and as a result, mobile services developed at a very slow rate. In 1993, the year when the Chinese government decided to establish China Unicom, there were less than one million mobilephone subscribers. The formal establishment of China Unicom in 1994 effectively challenged the monopoly operation of the former MPT. On 17 July 1995, a year after its establishment, China Unicom formally launched its mobile service in Beijing, Shanghai, Tianjin and Guangzhou. Since then, customers have benefited enormously from the competition between China Telecom and China Unicom. They have already benefited from reduced handset prices and installation fees, shortened waiting lists and improved quality of service. The first advantage of competition was that it put an end to the monopoly supply of handsets. China Unicom provided connection to any subscriber regardless of the source of the handset. Although a by-product of this strategy is the growing cases of loosing handsets, it has led to the significant reduction of handset price. Figure 3.1 illustrates the drastic reduction in average mobile handset prices (including connection fees) since China Unicom entered the market. The second effect of competition was the reduction in the per-minute retail tariff. 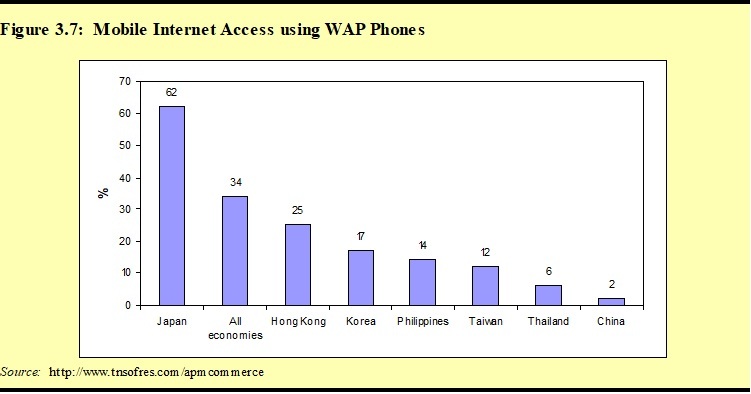 According to the ITU’s 1999 World Telecommunication Development Report (WTDR), the price of using a mobilephone in China is among the lowest in the world (Figure 3.2). Thirdly, the introduction of competition has stimulated the adoption of more advanced technologies for mobile services. For the eight years prior to China Unicom’s entry into the mobile market with GSM technology, the incumbent (China Telecom) had maintained the use of analogue technology, such as Total Access Communications System (TACS), despite the fact that digital Global System Mobile (GSM) technology had been available as early as 1991. The high quality of the GSM system differentiated China Unicom’s service from China Telecom’s service, and this placed the incumbent under significant competitive pressure. As a result, China Telecom was forced to upgrade its own network from analogue to digital in 1995. By the end of 2000, 96.20 per cent of Chinese mobile subscribers were using the GSM system. In 1998, the Chinese regulatory framework was restructured in order to further encourage competition in the industry. The establishment of a new independent regulator, the Ministry of Information Industry (MII), and the separation of China Mobile from China Telecom, have further paved the way for competition. Several major steps have been taken by the MII since its establishment. The most recent regulatory move has obliged the incumbent operator (China Mobile) to provide a roaming service to China Unicom’s subscribers in areas that have not yet been covered by new entrant’s mobile network. Thus, China Unicom’s subscribers can now benefit from nationwide roaming services, just like China Mobile’s subscribers. As a result of these regulatory changes, China Unicom has achieved rapid network expansion in 1999 and 2000: its market share jumped from less than 6 per cent in 1998 to more than 22 per cent in 2000 (Figure 3.3). However, because of the state ownership of both China Mobile and China Unicom, the full benefits of liberalisation could not be fully achieved. For example, due to regulatory concerns over “vicious competition” leading to the devaluation of state assets, both operators were to abide by a ‘price-floor’ set by the regulator, and China Unicom was only permitted to reduce this tariff by a maximum of 10 per cent below the regulated rate. Although some local operating companies of China Unicom and China Mobile tried to counter this regulation by offering dramatic discounts to subscribers, they were immediately banned by the telecommunications regulator or the Bureau of Price Administration, a powerful watchdog for price regulation in almost all industrial and commercial sectors. In April 2000, the regulator intervened and China Unicom and China Mobile agreed to abide by the regulator’s set tariff without provoking a price war. From then on, any price reduction required regulatory authorisation. Nevertheless, competition has been a strong catalyst for the development of mobile communications in China. Figure 3.4 shows the exponential growth of mobile subscribers in China since China Unicom entered the market in 1994. The averaged annual growth rate of mobile subscribers between 1994 and 1999 was 103.66 per cent. According to the latest statistics, both China Mobile and China Unicom are among the top eight mobile operators in the world (Figure 3.5). The Chinese mobile communications market has enjoyed impressive growth in recent years in terms of the number of subscribers. However, it must be noted that subscribers do not necessarily equate to users. 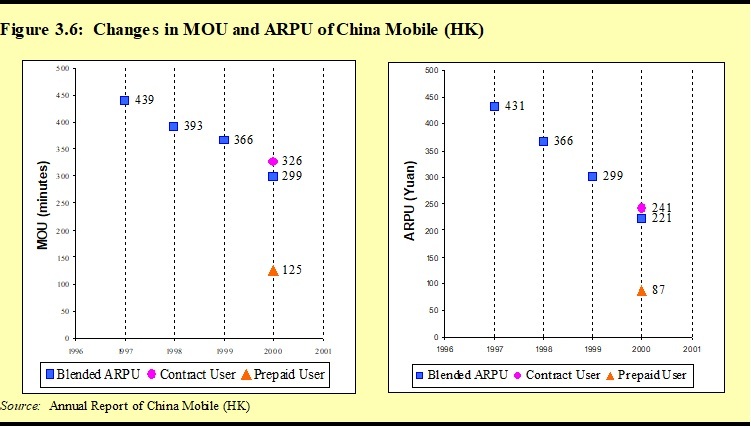 Figure 3.6 shows the decline of Average Revenue Per User (ARPU) per month and Minutes of Usage (MOU) per user per month of China Mobile (HK) over the last 5 years. The ARPU was 221 Yuan (US$26.69) in 2000, representing a decline of 26.1 per cent compared with 1999. The MOU in 2000 was 299 minutes, declining by 18.1 per cent compared with 1999. The decline in ARPU and MOU was mainly due to the substantial increase in lower usage subscribers, and, in particular, subscribers of pre-paid services. In order to fully explore the potential of the network resources and to generate more revenue from current subscribers, both China Mobile and China Unicom have introduced a variety of value added services in past years. These services include caller number display, voice mail, short messages, call forwarding, call waiting, three party call, VoIP long distance call, etc. In an effort to keep up with mobile commerce developments world-wide, both China Mobile and China Unicom formally launched their nation-wide WAP (Wireless Application Protocol) service on World Telecommunication Day, namely May 17th 2000. Services now available through WAP include mobile banking, stock trading, news, weather report and e-mail. In contrast, subscribers of the famous i-mode service in Japan have increased at an average rate of around 668,700 per month since the service was launched on 22 February 1999. In fact, in May 2000, the operator had to temporarily suspend the sign-up of new subscribers because demand surpassed system capacity. By June 2001, the total number of i-mode subscribers had reached 24.3 million. The inconsistent response from the market might result from inherent differences in the technologies upon which WAP and i-mode are based. Firstly, WAP uses Wireless Mark-up Language (WML) for programming content. This implies that content providers have to first learn this language before they are able to provide content for the operators. This means that they would need to recuperate this cost through user access charges. As a result, the availability of content is limited. In the case of i-mode, compact HTML (CHTML), a subset of HTML 3.0 for Internet content, is used for programming. This practically eliminates the switching cost for content providers if wishing to make their services available on i-mode. Secondly, WAP currently runs over circuit-switched networks with low transmission speeds and per-minute charging. Users are billed according to the time that they spend online or occupy the circuit, whereas in the case of i-mode, the packet switching system PDC-P is used, which is fast for transmission and the user pays for each packet of data, rather than the time online. Currently, one packet of 128 bytes of data is charged at a rate of 0.3 Yen, or approximately 0.3 US cent, which is 80% cheaper than the circuit switching system for the same volume of content. Thirdly, for information access via WAP, the user is obliged to key in a username, password as well as dial several numbers. On average, it takes 30 seconds to get connected to the network. For i-mode, packet switching places the handset in an ‘always on’ mode, which means that users do not pay for the time they spend online. The i-mode handset is always on ‘stand by’, ready to receive data, thereby providing increased convenience to users. In addition to the technical strengths outlined above, NTT DoCoMo has also created a successful business model. It provides a platform upon which content providers supply the content, either for free or for a small premium fee, which is set at a maximum of 300 Yen per month. NTT DoCoMo shares traffic revenue related to content with the providers of the content, and typically keeps a 9 per cent commission fee. This has provided a strong incentive for content providers. As a result, a large amount of Japanese content is now available. In April 2000, for example, 448 application alliance partner companies and 8,023 voluntary i-mode Internet websites, including 20 search engines, have content provision contracts with NTTDoCoMo. The availability of all of this content has attracted more and more subscribers. As more subscribers sign up for i-mode, more content providers are enticed to provide more content. A positive feedback process is thus established. NTT DoCoMo’s success in Japan has provided Chinese cellular operators with valuable experience. In November 2000, China Mobile introduced the Monternet program. Under this program, service providers can access the carrier’s mobile network at any place to provide nation-wide service. This is also known as the “one-stop shop, China-wide service” arrangement. China Mobile keeps 9 per cent of the traffic revenue while the information service providers receive 91 per cent of the revenue. If the arrangement is to include coverage for bad debts, China Mobile increases its commission to 15 per cent. The Monternet program has generated an overwhelming response from service providers. By the end of March 2001, 102 service providers had joined the Monternet program for co-operation in the mobile Internet market. These service providers include Sohu, Sina and other Internet portals. None of these companies have made any profit through their Internet businesses, but Monternet has opened up new possibilities, with subscribers paying for every message they receive. In the world of mobile Internet, there is no such thing as a “free lunch”. Currently, these service providers offer several types of services, including message-on-demand, message broadcasting, banking, stock-trading, etc… For example, subscribers can visit the website of Sohu and subscribe to customised news, such as sports and entertainment. This allows them to receive the latest news via their handsets on a regular basis. At this time, China Mobile charges 0.2 Yuan (US$0.024) for each piece of news. For information ordered by the handset, China mobile will charge 0.1 Yuan (US$0.012) for the requesting message and a different rate for terminating the message (see Table 3.1 for an overview of charges). In addition to the transmission fee, content providers may also charge a content fee, and the rate varies depending on the individual service provider. For instance, NewPalm delivers daily weather reports to a subscribers handset for a total monthly fee of four Yuan (US$0.48). China Mobile collects this content fee on behalf of the content provider, and also shares the transmission fee with them. In order to facilitate the Monternet program, China Mobile set up a subsidiary by the name of Aspire in the last quarter of 2000. Hewlett Packard invested US$35 million in the company and owns 7 per cent of it. Aspire is currently involved in the construction of the Mobile Information Service Centre (MISC) platform. The MISC is meant to serve as the common platform for all mobile Internet services of China Mobile. It is installed in stages based on a distributed structure in China Mobile’s provincial operating subsidiaries. A unified MISC platform will provide mobile subscribers with mobile data roaming capabilities. The MISC will also provide a uniform data interface open to third party service providers, through which standard network information (such as billing) can be provided. The segregation of service platforms from the base mobile communication services will ensure that all mobile communications networks developed through the platform can be smoothly migrated when they are upgraded to 2.5G and 3G, making them truly “future compatible networks”. Another strategy for facilitating China Mobile’s Monternet program is the upgrade of its current circuit-switching network to a packet-based one. On 21 January 2001, China Mobile formally kicked off its General Packet Radio Service (GRPS) network project. At the completion of the first phase of the project, by the second quarter of 2001, the GPRS network is to cover 16 provinces and 25 major cities. Despite concerted efforts on the part of operators to upgrade their technology, the real growth of mobile data services actually lies in the short message service (SMS) – one of the simplest value-added service based on the GSM standard. For China Mobile (HK), the usage volume of SMS increased from 56.72 million messages in the first quarter of 2000 to 191.52 million messages in the fourth quarter of 2000, representing an increase of 237.7 per cent (Figure 3.8). This phenomenal increase in SMS use is hardly surprising. 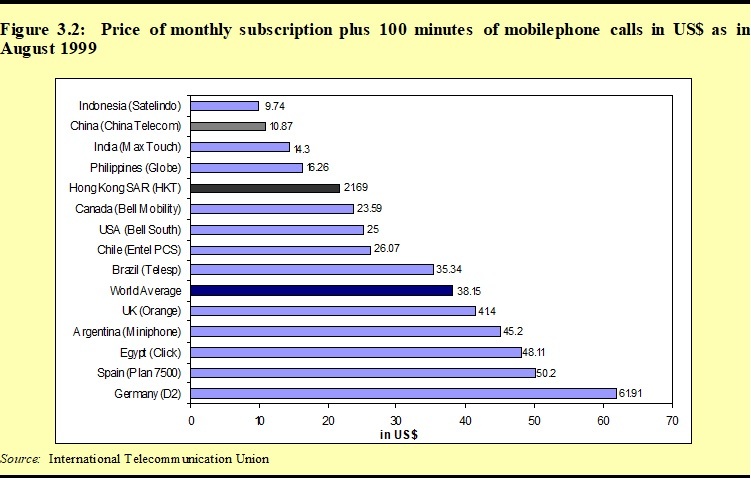 According to market research sponsored by China Mobile, the mobile data service most in demand is e-mail (Figure 3.9). This reflects China’s current market conditions. 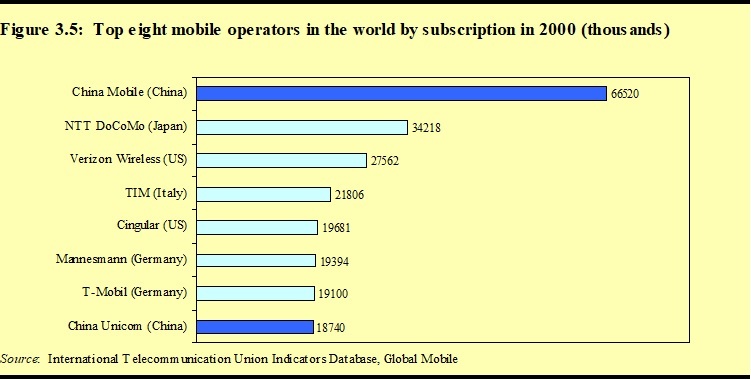 By the end of 2000, there were 85.260 million mobile subscribers but only 16.017 million Internet subscribers. This implies that the wireless Internet is more widely accessible than wireline Internet. Thus, subscribers use their mobile handsets as a substitute for sending and receiving e-mail, or, more accurately, text messages. In fact, some wireline Internet portals also provide a service that enables users to send SMS via their PC to the handsets of mobilephone users. In this way, the simple SMS acts as a bridge between the wireless Internet and the wireline Internet. SMS provides an economical way to communicate. The end-user price for sending and receiving a message is 0.10 Yuan (US$0.012), whereas a one-minute call costs 0.40 Yuan (US$0.048). In addition, the minimum charged unit for mobile telephony in China is one minute. This implies that for unsophisticated information, the short message is more cost effective. And if the two communicating parties are located in two different cities, the advantage is even more evident, since the long distance charge for mobile service is 0.70 Yuan (US$0.084) per minute. SMS can be used in certain special circumstances. For example, when one of the two parties is in the middle of a conference, he can still receive and reply to short messages without disturbing other conference participants. The wide application of the short message system might change the phenomenon of talking on the phone in conference rooms and cinemas, – a phenomenon which has not been unpopular in some Asian economies. The short message might express some information more adequately than the verbal medium. A large number of messages, for instance, were delivered as greetings during Chinese New Year and Valentine’s Day. SMS is more suitable for broadcasting information. 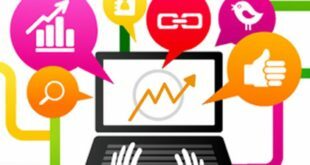 Many m-commerce companies, like Realvision, began to provide solutions for some companies to broadcast corporate internal information. Organisations such as insurance companies, hydro-electric companies, national and city police, which have several dispersed branches and employees, are heavy users of the short message broadcasting service. The enormous increase in SMS messages reveals the huge potential for the future development of the wireless data communication market in China. As a result, many players have moved into this market. At the same time, new technical solutions and business models have been created. In fact, the only bottleneck, according to Ken Woo, Vice-President of Cyber on-Air – an active player in China’s mobile commerce market, lies in the slow transmission speed of the network. Developing a broadband 3G network is therefore indeed critical to the future development of mobile commerce in China. The radio spectrum is an enormously valuable and scarce natural resource. To fully exploit the potential of this resource efficiently, more and more countries are taking the approach of commercialising the radio spectrum. In China, according to the “Radio Spectrum Regulation of the People’s Republic of China” published in 1993, one of the four principles of radio spectrum regulation is that the users should pay for occupying spectrum. At present, for cellular mobile services, both China Mobile and China Unicom were allocated spectrum at no cost, but individual subscribers have to pay a so-called ‘spectrum occupation fee” every year. The spectrum occupation fee is to be handed over by the operators to the Radio Regulatory Department of the Ministry of Information Industry, which was formerly known as State Radio Regulatory Committee. At the moment, the spectrum occupation fee is 50 Yuan per subscriber, or US$6.06. Taking the year 2000 as an example, the spectrum occupation fee reached a total of 4,263 million Yuan, or US$ 516.72 million, as there were a total of 85.26 million mobile subscribers by the end of the year. Article 27: The State applies unified planning, centralised administration, and rational allocation of telecom resources, and institutes a system of paid use.Telecom resource as mentioned above refers to limited resources used for realising telecom functions, such as radio spectrums, satellite orbital positions and telecom network numbers. information industry under the State Council in conjunction with the authorities in charge of finance and price under the state council, and shall be promulgated for implementation after the approval by the state council. Article 29: The telecom resource should be allocated in consideration of planning, usage and forecasted capacity of the related resource. The telecom resource can be allocated in the way of assignment, or, in the way of auction. This green light in the regulation has not led to a corresponding boom in telecom resource auctions. Thus far, auctions have only been used in some provinces for allocating telephone numbers containing lucky numbers such as “8”. Spectrum auctions have not risen to the top of the regulator’s agenda. On 11 September 2000, Wu Ji Chuan, the Minister of Information Industry, told a journalist during an interview with the Financial Times that the 3G auction in Europe is not applicable to the Chinese market, as he “does not wish to see that the development of 3G technology will generate a big bubble”. He added that “so far, there has been not a definite standard and feasible services for 3G. Take Germany as an example, how many years it might take the licensees to retrieve the US$4 billion licence fee back?”. On 6 March 2001, Minister Wu further highlighted his vision of 3G licensing when he was interviewed by a group of overseas journalists, saying: “you shall analyse why investors keep selling the telecom shares in Europe and the America. The 3G license is too expensive. A license was sold at a price of several billion US dollars even before we understand what the service will be like and how much the service will be charged. This will undoubtedly jeopardise the operators’ positions”. He emphasised that the 3G licenses in China will be issued in a smoother and more efficient manner, taking into account the specific context of China, and that any speculation would be discouraged. In addition to concerns about the financial burden on operators, the state majority ownership of China Mobile and China Unicom is another disincentive for auctioning the spectrum. The licence fee in an auction will be transferred from one arm of the state government to another, and therefore the benefit to governments of an auction is not as evident and attractive as in economies where the operations are left in the hands of the private sector. However, during the aforementioned interview, Minister Wu did confirm that operators should pay for the spectrum. The method will be designed in a way that meets the specific situation of China. This is consistent with the principle of the Telecommunications Regulation of 2000 that “Telecom operators should pay for telecom resource charges for their occupation and use of telecom resources”. According to the Ministry of Information Industry, the purpose of this principle is to prevent the operators from occupying resources without using them, or making limited use of them. By allocating spectrum in commercial terms, supply and demand can be appropriately adjusted, and the resource can be thus more effectively allocated. price of relevant economies and then allocating the spectrum to operators according to this defined rate. Although this might be influenced by subjective factors, it can prevent over-speculation of the spectrum price. On 29 June 2001, the Ministry of Information Industry promulgated a tender invitation for spectrum in 3.5GHz range, which is specifically used for wireless local loop services. The price for spectrum is not included in the criteria, but the basic capability of the bidder and their spectrum usage schemes would be major concerns of this ‘beauty contest’. The tender marked a breakthrough in spectrum regulation in China, as it indicates the over of bureaucratic assignment of scare resources. In fact, unlike Hong Kong and other economies, the principal issue for 3G development seems to lie not in the allocation of spectrum but in the choice of 3G standard. This is because 3G is not just significant for Chinese operators, but it is also critical for the Chinese telecommunications manufacturing industry. When China began to reform its telecommunications system in the early 1980s, it realised that its infrastructure lagged far behind that of developed economies, not just in terms of teledensity but also in terms of technological sophistication. The whole network was based on analogue technology and the Chinese vendors could only produce switching systems based on bar-switching and step-switching. Both long-distance and international calls had to be connected manually via human operators. In 1982, the Fujian province imported and installed the first Stored Program Control (SPC) switching system in China. The high quality and innovative features of the SPC system consequently brought about a boom in equipment imports. Due to the late-mover advantage, China immediately caught up the latest technologies, including SPC switching, digital microwave, optical fibres and satellite communications. By the end of 1998, 99.6 per cent of the transmission system and 98.8 per cent of the local switching system had been digitised. At the same time, however, billions of hard currencies were spent on imports. In order to enable domestic vendors to upgrade their technology and gradually get rid of dependence on foreign products, the government formulated a strategic policy of import, digestion, absorption and creation in the early 1980s. Using the domestic market to exchange foreign technology has been a preferred strategy of upgrading the technology of domestic manufacturers. The huge telecommunication market provided the Chinese government with strong bargaining power to urge foreign vendors to transfer their technology when a trade deal was made between the two parties, especially when a joint venture was to be established. For example, when the first joint venture for switching equipment – ShanghaiBell – was established in 1984, the Chinese government defined clear terms on which technologies should be transferred to the Chinese side by the Belgian partner and in what manner. In 1998, more than 74% of ShanghaiBell’s hardware and 90% of its software products were developed and made in China. The government also allocated quotas to this joint venture, which defined the maximum that ShanghaiBell could sell to the domestic market. By 1999, its products have been exported to Korea, Vietnam, Philippine, Germany, Spain, Australia, Belgium and other countries with a total revenue of 282 billion Yuan, or US$34.18 billion. In addition to setting up joint ventures, the Chinese government has provided favourable support to domestic manufacturers. This support included the assignment of a research grant for R&D, low interest loans, discounted tax rates and a generous provision of land in high-tech industrial parks. This support has been very effective. In the mid 1990s’, several domestic manufacturers were well established, including Julong, Datang, Zhongxing (ZTE) and Huawei. Currently in China, professionals in the telecommunication industry used to use “Ju Da Zhong Hua”, the combination of the first character of above corporations’ name, which in Chinese stands for “Giant China”, to represent the national telecommunication manufacturing industry. These domestic vendors have achieved tremendous success in the manufacturing of transmission and switching equipment. In 1992, the first SPC (Stored Program Control) switching system of 10,000 lines was made in China with China-owned intellectual property rights. Since then, with the support of the government, local manufacturers began to dominate the local market. In 1998, local manufacturers supplied 98 per cent of the newly increased switching equipment for fixed local networks and 50 per cent of newly increased optical transmission systems. In 1999, the market share of local vendors in switching equipment rose to over 99 per cent. At the same time, more and more local products have been exported to foreign countries. In 1999, the total revenue from exporting telecommunication equipment and systems reached US$ 46.6 billion. The achievement of domestic manufacturers has strongly encouraged the Chinese government and industrial sectors to move aggressively into the prosperous mobile communication sector. In January 1999, the State Council issued a document entitled “Several Issues on Speeding up the Development of Chinese Mobile Communications Industry”. According to this document, from 1999 to 2003, the government intends to use 5 per cent of the fixed-line telephone connection fee as a special grant for the R&D of mobile technologies. In 1999, the Ministry of Information Industry used 1.4 billion Yuan (US$169.70 million) from mobile connection fee to support R&D of mobile technology. In addition, the State Planning Commission and the Ministry of Finance raised 570 million Yuan, or US$ 69 million, to support 31 projects in 7 categories relating to mobile communication technology. In November 1999, the first assembly line for mobile handsets began its operations. In the same year, domestic vendors made a breakthrough by entering the mobile market. In 2000, 10 domestic vendors produced 3.44 million handsets, of which they sold 3.26 million. The total capacity of the mobile switching system that was sold in 2000 reached 5.85 million lines while sales of mobile base stations reached 145,000 sets. Figure 4.2 shows the growth of the market share of Chinese domestic vendors over the past two years. The products of domestic manufacturers have intensified competition in the equipment market. In response, foreign vendors had to reduce their prices. According to the Ministry of Information Industry, as a result of this competition, Chinese mobile operators have saved a total of 15 billion Yuan, or US$1.82 billion, over the past two years. Up until now, Chinese manufacturers have obtained patents for SIM cards, batteries, LED monitors, filters, high frequency switches and other components. However, foreign GSM vendors have patented most of the key GSM technologies. According to statistics, there are 140 GSM patent categories, 369 independent patents, all of which are owned by only 17 corporations. The patent fee ranges from 3-30%. Thus, Chinese domestic vendors have to pay onerous patent fees to foreign companies. Unlike GSM, Chinese vendors moved very quickly in CDMA technology. So far, Chinese domestic manufacturers have developed all of the key switching and base station technologies for the CDMA system with the exception of the base-band chip, which has been patented by Qualcomm of the US. This includes CDMA (IS-95A) and CDMA (2000-1X) switches, base stations and handsets. Huawei, for example, has invested heavily in the development of CDMA technology since 1996 and has obtained 97 patents. At this time, it is able to fulfill a regular order in 45 days and an emergency order in 30 days. The success of Chinese vendors in terms of CDMA technology has strongly encouraged the Chinese government to rollout a CDMA network. On 1 January 2001, Great Wall, a joint venture between China Telecom and the engineering wing of the People’s Liberalisation Army (PLA), (which has itself provided a CDMA service in Beijing, Shanghai, Xi’an and Guangzhou without owning a formal license) was transferred to China Unicom. On the one hand, it appears to be the result of newly published regulations stating that no military unit should be involved in commercial activities. On the other hand, it sent a signal that the Chinese government would like to boost the CDMA network, despite the fact that the Great Wall’s network had only 200,000 subscribers, substantially less than the 56 million subscribers of the GSM system. On 13 January 2001, China Unicom announced that it would construct the world’s largest CDMA network with a capacity of 13.3 million lines after the completion of the first phase. By 2003, the total capacity would reach 30 million. On the next day, Unicom Horizon, an independent subsidiary of China Unicom, obtained a licence for operating a CDMA network. China Unicom also signed the “CDMA Intellectual Property Rights Framework Agreement” with Qualcomm. Under this agreement, equipment suppliers of Unicom Horizon were only obliged to pay Qualcomm intellectual property rights (IPR) royalties of 1.5 per cent. This is a very favourable arrangement, given that Qualcomm charges Korean manufacturers IPR royalties of 6 per cent. A nation-wide network immediately resulted in a new giant market. From 28 March to 28 April 2001, China Unicom invited tenders for CDMA network switching systems and base-stations worth 20 billion Yuan, or US$2.42 billion. There were 12 companies bidding for switching systems and 6 companies for base stations. Realising that the Chinese government would like to use CDMA to stimulate the domestic manufacturing sector, almost all foreign manufacturers set up partnerships with domestic vendors or China-based joint ventures: Huawei (Motorola, Ericsson), ShanghaiBell (Samsung), Nanjing Panda (Ericsson), Qingdao Lucent (Lucent), Guangdong Nortel (Nortel), Julong (Ericsson), Shouxin (LG), Datang (Nortel, Lucent), Hangzhou Motorola (Motorola), Eastern Communication (Motorola, Ericsson). Only Zhongxing (ZTE) joined the bidding independently without setting up partnership with foreign vendors. A clear evidence of the support to domestic manufacturers was that ZTE was set to bid for 6.6 million lines out of 13.3 million lines, the highest among all bidders. On 15 May 2001, China Unicom formally released the results of the tender. ZTE and nine other companies won the bid and formally signed the agreement with Unicom Horizon. ZTE won 7.5% of the market agreeing to supply the CDMA system with 1.1 million lines to Guangdong, Guizhou, Yunnan, Shanxi, Hainan, Hubei, Inner Mongolia, Ningxia, Qinghai and Tibet. Although ZTE complained that its market was mainly located in remote areas, it is nevertheless a milestone for the Chinese telecommunication manufacturing industry, because for the first time a Chinese domestic vendor is able to provide a total network solution to mobile operators. However, Chinese manufacturers will not stop at their current achievements. TD-SCDMA, the 3G standard proposed by China and approved by ITU, has extended the ambitions of the Chinese manufacturing industry beyond second-generation mobile communications. TD-SCDMA: A goose laying golden eggs? On 29 June 1998, the last day set by the International Telecommunication Union (ITU) for the submission of IMT-2000 standards from individual member countries, China faxed its own proposal to Geneva. Signed by the Minister and two Vice-Ministers of the Ministry of Information Industry, this proposal proposed a so-called Time Division Synchronous Code Division Multiple Access (TD-SCDMA) standard. By its deadline, the ITU had received a total of 16 proposals from North America, Europe, Japan and China. After much discussion and debate, TD-SCDMA, together with SC-TDMA (UMC-136), MC-TDMA (EP-DECT), MC-CDMA (CDMA2000), DS-CDMA (WCDMA), were accepted as radio interface standards by the ITU-R on 5 November 1999. In May 2000, at the World Radio Conference (WRC) of the ITU, TD-SCDMA was accepted as one of the three 3G transmission standards, together with CDMA2000 and W-CDMA (Wideband CDMA). On 16 March 2001, TD-SCDMA made another breakthrough: at the 11th plenary session of 3GPP (Third Generation Partnership Project), all technical schemes of TD-SCDMA standard were accepted by 3GPP and were included in 3GPP’s 4th Release. This indicates that TD-SCDMA has not only been accepted by the ITU, but also by an industry alliance of operators and vendors. TD-SCDMA marks a milestone for the Chinese telecommunications industry, as it is the very first telecommunication standard proposed by China to be internationally accepted. The long-time efforts of the Chinese government and the industry have finally paid off. As early as June 1992, the State Planning Commission (SPC) and the former Ministry of Posts and Telecommunications (MPT) sponsored a research project entitled “Digital Mobile Communications Technology (GSM)”. The Chinese Academy of Telecommunications Technology, also known as Datang Telecom Technology & Industry Group, undertook this project. After four years of hard work, the prototype of the GSM system passed the test of the SPC and the former MPT. However, due to early mover advantages, foreign vendors continuously dominated the Chinese GSM market. As Figure 4.2 indicates, Chinese vendors have only secured a limited market share. At the same time, they have to pay tremendously high patent fees to foreign intellectual property rights owners. According to some recent statistics, such payments reached over 10 billion Yuan (US$ 1.21 billion) by the middle of 2000. In 1997, the ITU called for proposals for IMT-2000 standards. This provided the Chinese telecommunication manufacturing industry with a significant opportunity. In the same year, Datang’s SCDMA system – a wireless access technology – passed the state-level test. As it adopted many leading-edge technologies, such as synchronous CDMA, software-defined radio and smart antenna, the former MPT decided to propose the Chinese 3G standard on the basis of SCDMA. In May 1998, a group of engineers began to draft the proposal of TD-SCDMA, which was later submitted to the ITU. Compared with WCDMA and CDMA2000, TD-SCDMA has certain distinguishing characteristics. First, the application of smart antenna and the low chip rate of 1.28Mbit/s can significantly improve the efficiency of spectrum usage. For example, in order to transmit traffic at the rate of 2Mbit/s, both CDMA2000 and WCDMA need two 5M bands while TD-SCDMA only requires one 1.6M band. This feature is critical, particularly for densely populated economies like China and especially in metropolitan areas. Second, the application of smart antenna can also enhance antenna gains due to its feature of adaptive beam-forming, or its ability to target and track a specific object with a single beam of signal rather than sending or receiving signals via all dimensions like the current GSM systems, which will significantly save the energy and improve the power efficiency of the base station. Additionally, as smart antennae use an array of small power amplifiers, which are much cheaper than a single high power amplifier, the cost of base stations can be reduced dramatically. The antenna array can also strengthen the reliability of the base station, as the system would continue working even if part of the eight sending/receiving systems were out of order. Third, TD-SCDMA uses two asymmetric bands for uploading and downloading traffic, which is similar to the Asymmetric Digital Subscriber Line (ADSL) of the fixed line broadband system. This is based on the expectation that 3G is mainly used for downloading contents from wireless portals. Fourth, the application of software-defined radio enables the application of multiple features on the same hardware platform. On the one hand, it will reduce the size and cost of the system. And on the other hand, it may serve to overcome China’s weakness in chip manufacturing technology. The last and most important feature of TD-SCDMA is that it can enable a smooth transition from current GSM system to future 3G systems. The TD-SCDMA is designed as a dual band and dual mode system. When 3G base stations are available, they can be installed in the same place as the GSM base station. In its coverage area, therefore, TD-SCDMA could support both GSM and 3G services. In areas that have not been covered by 3G base stations, the GSM service would still be available. For this, the handset should be able to accommodate dual band and dual mode. With the application of software-defined radio, this will not be difficult to achieve. However, the TD-SCDMA system also has certain limits. According to ZTE, supporter of CDMA2000, TD-SCDMA is arguably more suited to metropolitan areas than to remote areas. As ZTE is now one of the major suppliers of Unicom Horizon’s CDMA system, its viewpoint might be biased due to the fact that CDMA2000 will evolve much more easily from a CDMA network. In fact, CDMA2000 has raised concerns in China because CDMA2000 will depend upon the Global Positioning System (GPS) of the United States and thus security and reliability may be influenced by political factors. Perhaps the true weakness of TD-SCDMA lies in the fact that it was proposed two years later than CDMA2000 and WCDMA. The first test of the system was successfully conducted in Beijing on 11 April 2001. By that time, NEC, Ericsson and other foreign vendors had received a certain amount of orders for the WCDMA system. In order to catch up, China needs to accelerate its development of TD-SCDMA. According to Datang, TD-SCDMA base stations will be available in the early 2002. The postponement of the WCDMA service launch by NTT DoCoMo (Japan) and Manx Telecom (Isle of Man) has provided Datang with very valuable time to achieve its objective. 3G Licensing in China: Who will be the winner? individual domestic vendor, such as Datang, ZTE, Julong, who control part of the intellectual property rights of a specific technology, such as ZTE with CDMA2000. The question that now faces the Chinese government and operators is which 3G technology to adopt. As 3G in China will be a US$100 billion market, the decision will have significant implications for operators, domestic manufacturers and foreign vendors. The Ministry of Information Industry (MII) has until now kept silent on which standard China will adopt. As a government department that is accountable to both telecommunication operations and IT manufacturing, it is difficult for the MII to take a technology neutral stance, like overseas regulators such as OFTA (Hong Kong) have done for the development of 3G policy. Its heavy sponsorship has clearly indicated that the MII would like to use 3G as an impetus to repeat China’s success in fixed line system manufacturing. However, due to the fact that both China Mobile and China Unicom have been partly and indirectly listed in overseas stock markets, the MII would not like to force operators to adopt a specific standard, as this might give investors the impression of over zealous government intervention. This would be unfavourable to the listing of China Telecom and other Chinese telecommunications companies in the future. China’s potential entry into the World Trade Organisation (WTO) also puts some restraints on the clear expression and elaboration of the MII’s intentions. Both China Mobile and China Unicom have shown their enthusiasm for co-operating with Datang and have agreed to provide network capacity for the trial of the TD-SCDMA system. Li Mo Fang, Chief Engineer of China Mobile, clearly indicated that China Mobile might use both TD-SCDMA and WCDMA for its future 3G network, as these two systems will enable a smooth upgrading of China Mobile’s current GSM network to 3G. Additionally, the two technologies can supplement each other due to their different technical strengths. In another interview with ComputerWorld, she further highlighted the point that “the real development of the mobile communications industry depends on the joint efforts of R&D, vendors and operators. If the trial is successful, and TD-SCDMA is proven to be a good technology, we are going to adopt this technology”. For Datang, this is undoubtedly good news. Unicom Horizon’s newly built CDMA network might provide a future market for ZTE and North American vendors. ZTE is very confident about CDMA2000 technology, for which it has been granted some intellectual property rights. The encouraging progress that ZTE has made in CDMA will undoubtedly raise the Chinese government’s expectations as to the role to be played by ZTE in future CDMA2000 technology. The ZTE’s CDMA2000 efforts can also reduce the opportunity cost for the Chinese telecommunications industry as a whole in the eventuality that TD-SCDMA fails to provide satisfactory commercial products. Most foreign vendors have taken strategy manoeuvres in the past two years. At the beginning, many vendors tried to convince the Chinese government that TD-SCDMA is not a feasible standard. They have lobbied many government departments, including relatives of government officials. Some even asked the Chinese government “why China still wants to develop its own system? You are going to join the WTO, so just simply buy our products”. However, the determined support of the Chinese government for TD-SCDMA demonstrated to foreign vendors that a better approach might be co-operation instead of confrontation. Siemens was the first foreign vendor to join with Datang for TD-SCDMA development. In July 1998, Siemens signed an agreement with Datang to jointly develop the TD-SCDMA system. By early 2001, Siemens had invested US$1 billion in the project, and set up joint laboratories with Datang in Beijing, Munich, Berlin, Milan, Vienna and London. More than 500 Siemens researchers are now working in China, and Siemens’s 3G mobile communication research centre is now under construction in Beijing. On 22 September 2000, Motorola, Nortel, Siemens, together with Datang, Huawei, China Mobile and China Unicom, initiated the establishment of a TD-SCDMA Technology Forum which aims to provide a platform for technology exchange among interested parties. On 25 March 2001, the forum formally launched its website at http://www.tdscdma-forum.org. By the end of May 2001, there were 218 members, including foreign and domestic vendors, operators, chip producers, ICPs, research institutes, universities and venture capital investors. When doing business in China, all parties have to remain realistic and pragmatic. TD-SCDMA has become a popular standard, but there is still a long road ahead to turn it into a commercial product. China would not like to waste its investment in 3G by encouraging operators to use only foreign products. At the same time, it cannot afford to wait if 3G is rolled out at a fast pace in other economies. Up until now, no mature 3G products have emerged on the global market and thus China could still await the commercialisation of its own products. 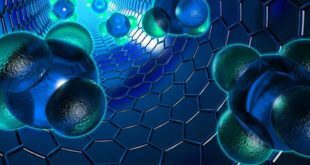 In this sense, the critical issue for 3G licensing in China does not lie in what methods should be used to issue licenses or the cost of such licenses, but rather in the time to market for mature TD-SCDMA products. 3G licensing in China is a function with multiple variables. Economic implications underlying 3G development are complex and significant. To turn TD-SCDMA into a goose that lies golden eggs is a competition against both rivals and time. Effective joint efforts between the government, the vendors and the operators is critical. Importantly, 3G licensing may also lead to a breakthrough in the framework of spectrum regulation. Although auction does not seem to be adopted by the Chinese regulator, the proposed method of pricing the spectrum by benchmarking the price of other countries and shifting the payment from subscribers to the operators would mark the beginning of spectrum commercialisation in real terms. The increasingly competitive market and increasingly scared spectrum need an effective spectrum regulatory framework. The tender for spectrums to be used for wireless local loops marked a positive step in the right direction. To maximise the benefits to the economy as a whole. Compared with China, the process of 3G policy making in Hong Kong SAR is relatively open, transparent and subject to full debate. On 21 March 2000, OFTA issued an industry consultation paper on the licensing framework for 3G mobile services. This first consultation paper identified and discussed several key issues on the licensing of 3G mobile services and consulted with the industry and interested parties on these issues. By the deadline of 22 May 2000, OFTA had received 49 submissions, including 17 from individuals and academic institutions, five from organisations representing different interests (e.g. Hong Kong Consumer Council), three from Legislative Councillors/political parties and the rest from operators (existing or potential) and equipment manufacturers. All submissions were posted on OFTA’s website (http://www.ofta.gov.hk). Based on the first round public consultation, OFTA issued its second consultation paper on 3 October 2000. This triggered off another round of debate and discussion. OFTA also organised an industry workshop on 5 January 2001 explaining its “Open Network” regulatory framework. Questions such as the definition of Mobile Virtual Network Operator (MVNO) and the measurement of network capacity to be made available were furiously debated. On 13 February 2001, the government finally announced the licensing framework for 3G services in Hong Kong SAR. As mentioned above, Hong Kong’s economy is service-based, and most industrial sectors are left in the hands of the private sector. Therefore, using the telecommunications market to enhance the development of the manufacturing industry is not necessarily a policy priority. This has enabled the regulator OFTA to adopt a technology-neutral approach in licensing since 1996, when seven PCS mobile communication licenses were first issued. Due to the fact that IMT-2000 is a family of 3G standards rather than a single standard, the question was whether Hong Kong should adopt a single 3G standard or multiple 3G standards. On the one hand, the government realised that the mandatory use of a single 3G standard would reduce the flexibility of operators in evolving their 2G networks to 3G and limit consumers’ choice of terminal equipment. On the other hand, the government is interested in promoting the adoption of technical standards that are compatible with each other from the users’ point of view, so that subscribers are not locked-in by any single operator. As with number portability, this will have the effect of reducing the switching cost when subscribers migrate from one operator to another. Another objective is to maximise the convenience of users in accessing roaming services without having to change handsets when they travel to places outside Hong Kong, particularly to the more popular destinations. This question is especially critical given that the time scale of the commercial application of software-defined radio is still uncertain. Based upon these considerations, OFTA intends to offer to prospective operators the use of any 3G standards within their assigned 3G frequency bands, subject to OFTA being satisfied that various technical standards are compatible with each other from the user’s point of view. The main consideration is to ensure that customers can easily switch from one network to another and obtain similar services, and to maximise the ease and practicality of roaming services without having to change mobile terminals. “…with 6 existing operators operating 11 networks of different standards in Hong Kong, a technology-neutral approach allows a smooth migration from the existing 2G services to 3G services in the future. The technology neutrality approach, which is consistent with the policy adopted by OFTA in previous licensing process, also encourages operators to explore new services available under respective standards”. However, former Cable & Wireless HKT (CWHKT) suggested that the adoption of multiple standards in Hong Kong might result in the requirement for guard bands between bands used by networks of different 3G standards, thus reducing the amount of usable spectrum. Also, it is unlikely that mobile terminals which are compatible with more than one 3G standard adopted by the ITU would be available in the initial years. The CWHKT strongly suggests that only the Universal Mobile Telecom Service (UMTS) of Europe, i.e., W-CDMA, should be adopted in Hong Kong. Currently, there are a total of four 2G standards being used by the six operators in Hong Kong (Table 5.1). It is expected that from the launch of 3G services, 3G mobile terminals would have to incorporate a dual mode design to enable backward compatibility with 2G networks. Thus, the availability of backward compatible equipment with existing 2G networks would be a constraint in the selection of 3G standards in Hong Kong. In this case, OFTA affirms that the prospective operators should be permitted to use any 3G standard adopted by the ITU within their assigned frequency bands for 3G mobile services, subject to standard compatibility from the user’s standpoint. OFTA expects that the operators would take these requirements into consideration when choosing a 3G standard and would put forward their choice in their license applications. The allocation of radio spectrum is a relatively simple issue in Hong Kong as most of the IMT-2000 defined spectrum is not presently being used. Only a portion of the spectrum is now being used for the operation of Microwave Multipoint Distribution Systems (MMDS) and microwave fixed links. At OFTA’s request, users of this band have agreed to relinquish the spectrum by the end of May 2001 for the introduction of 3G mobile services. Perhaps the major concern lies in how to handle spectrum which is currently used for 2G services. According to the World Radio Conference in Istanbul (WRC-2000), spectrums in 800/900 MHz and 1700/1800 MHz bands are allocated for implementing 3G services. In this case, there is a necessity to clarify how to migrate current 2G services to 3G services for current 2G license holders. In line with its technology neutral policy stance, and in order to allow existing 2G mobile operators to evolve their networks to 3G, OFTA decided to allow existing 2G operators, whether they are successful or not in obtaining 3G spectrum, to use any IMT-2000 standard within their assigned 2G frequency bands for 3G mobile services when equipment becomes commercially available. This would be subject, once again, to standard compatibility and the assurance that the interest of existing 2G consumers is adequately safeguarded. However, this has raised concerns from the industry, especially for potential applicants who currently do not hold a 2G licence, like New T&T Hong Kong Limited. This is because the incumbent 2G operators would in effect be “guaranteed” a right to offer at least some, if not all, 3G or 3G-compatible services even if they failed to obtain a 3G license or decide not to apply for a 3G license. This is unfair to the other license applicants and the problem would be exacerbated in the initial phases of the service launch, as the full range of services would not yet be available. Therefore, as suggested by New T&T, incumbent 2G mobile operators should not be given any undue advantage or “guarantee” of right. Another concern was that 3G spectrum would be auctioned whereas 2G spectrum was assigned through different procedures and in most cases without any license fee. This might put potential 3G licensees in an unfair position, especially those operators that are without 2G licenses. One submission suggested that the incumbent operators should pay a premium, to be channelled through a mechanism similar to the variation of land leases, in return for the right to provide 3G services in the 2G bands. There was also a view that, as 3G services would not be mature until 2005, the incumbent operators could wait for equipment availability to provide services in their 2G band. If 3G spectrum were granted to them, they should return their 2G spectrum to OFTA. OFTA believes that allowing the incumbents to make use of 2G spectrum for 3G services would be consistent with its policy of technological neutrality. It is up to individual operators to decide which technology is more efficient to use. Therefore, OFTA does not have any objection, in principle, to existing 2G operators making use of their own 2G spectrum for 3G services until their licenses expire. The resolution of the spectrum issue in the future will be the subject of another round of consultation prior to the expiry of current 2G licenses. Next to 3G standards and 2G spectrum migration, the important issue is licensing, notably the selection of operators. Hong Kong used to allocate spectrums to telecommunications licensees on the merits of applications. The major concern in the past, according to OFTA, is providing the opportunity to a maximum number of operators to enter the market and allow market forces to determine the optimum number of operators, as long as the spectrum is available. Although the auction method was suggested for spectrum allocation for 2G licenses, OFTA did not adopt this method due to the concern that operators will eventually pass the cost on to individual subscribers. However, spectrum is said to be a scarce resource and as such, must be used effectively. There should therefore be some financial pressure on operators to encourage the efficient utilisation of spectrum. OFTA’s preferred method is to set up a performance bond. When issuing the license, the regulator defined an array of milestones that the licensee should meet, mainly based on speed and coverage. Periodically, OFTA will review the progress of the licensee with reference to the defined milestones. If the operators fail to reach the milestone, they are liable for the performance bond. Before the license is issued, the bank will be asked to evaluate the financial strength of the applicant and guarantee the ability of the applicant to pay for the performance bond if required. In this manner, licensees are subject to financial pressure to rollout their networks aggressively, while at the same time avoiding the need for a lump sum payment at the beginning. This reduces the financial burden on operators, particularly new entrants. The method has worked fairly well over the past years. “Although auctions could bring significant revenue to the government coffers, OFTA is concerned that such additional upfront costs to 3G operators would greatly increase their business risk. This in turn could adversely affect the development of the next generation of telecommunications and Internet services in Hong Kong. I don’t think this argument is very sound. Regardless of how the licences are to be awarded, operators are likely to price their services according to how much the customers are willing to pay, and not according to the cost of providing such services … Companies which have over-stretched themselves will suffer, some may even go bankrupt. But other companies will bid for their licences and carry on. This is capitalism at work and should not harm the development of the industry”. “it is very difficult to define the milestone for 3G service due to the fact that there is not a definite date that this service will be commercially available. Nor did the business model. Even the GPRS (2.5G) is still under trial, how can the regulator clarify the rate of deploying 3G services? Wrongly defined milestones will leave the regulator in the embarrassment, but not the operators”. Xu was also concerned that if operators are granted free licenses in Hong Kong, some of them might use Hong Kong revenues to cross-subsidise their customers in the market where they have paid huge license fees. Indirectly, Hong Kong’s consumers would become the victims of huge license fees in other overseas markets. Some economists were in favour of auctions but pointed out that the conditions need to be justified once again, in order to ensure that spectrum fees are not artificially inflated. It was suggested that all of the spectrum should be open for the auction and there should not be a pre-determined number of licensees. However, there are some concerns about this. The first is that, as suggested by some delegates in WRC-2000, to give all spectrum to a single immature technology might be risky, which is also harmful for the development of other innovative services. Also, 3G is not the end of mobile communications, and 4G, even 5G might appear in coming years. In this case, if all spectrums are allocated to 3G, then operators might feel reluctant to upgrade their technology when the new technology is available. For example, when GSM was available, no licensees in Hong Kong reacted to it. It was only when OFTA issued a new license to SmarTone, and clearly defined that GSM had to be used, that digital network began to appear in Hong Kong. As a result, all incumbents had to change their system from analogue to digital. Keeping some spectrum aside might give more flexibility and bargaining power to OFTA in the future. Argument against auctioning the spectrum pointed out that, unlike some other economies, Hong Kong does not need to raise revenue through auctions. Proceeds from spectrum auctions imply a one-off revenue and do not provide a steady base for ongoing government revenue. Also, the spectrum auction process would only favour operators with deep pockets. As such, companies that are more likely to propose high-quality innovative services may fail to obtain licences. Another point is that 3G is a high-tech industry – its social benefits are much larger than the commercial benefits and will generate tremendous externalities. In an environment not favourable to high-tech investment, the success of 3G might be enhanced if the government could share part of the risk with investors. As this is a revenue risk but not a cost risk, the government’s total risk is close to nil. In this case, the government is probably the most appropriate party to undertake the risk. Taking into consideration all of the views from the different sectors, the government formally released its 3G licensing framework on 13 February 2001. The decision was taken to issue four licenses by way of auction after conducting a pre-qualification exercise. The pre-qualification process is intended to be relatively light, but will involve setting certain minimum criteria on investment, network rollout, service quality, financial capability, etc. As to the auction process, the government has chosen a royalty-based proposal that requires the bidder to pay a certain percentage of their annual 3G revenue turnover determined by the auction. The royalty payment will be subjected to a guaranteed, minimum payment. The government believes this method will encourage market entry while keeping the financial burden on operators at a manageable level.. According to the Government, this proposed method best meets its policy objectives. It is “pro-entry” as it alleviates the burden on successful 3G licensees, and allows the government to share the upside of the future 3G services market. 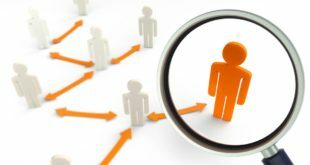 It is also an efficient method of allocating licences to those bidders with the best business case, as the payment will be in the form of royalty and therefore will depend on the actual performance of each licensee. The guaranteed, required minimum royalty payment will minimise credit risks for the Government, and reduce the costs that may be passed on to consumers. This proposal has been very well received, despite the fact that there is some controversy over the details of the auction design. For example, the government would like to settle on the final price when the fourth bidder from the bottom leaves the auction process, while the industry insists that the final price should be established when the fifth bidder from the bottom leaves. In this way, the price should be lower and the cost of licenses will be reduced. The Government finally reaches a compromise and agrees to establish the price when the fifth bidder from the bottom leaves. Due to the limitation on spectrum, only four 3G licenses will be issued. To enhance competition, OFTA proposed the concept of separating service provision from network operation. This means that a service provider need not also be a network operator, although that possibility is not excluded. This is comparable to the European concept of the Mobile Virtual Network Operator (MVNO). In this case, the MVNO would not own a license to use radio spectrum, but would have access to the radio networks of one or more of the mobile network operators and be allowed to build and operate parts of the networks not requiring the use of radio spectrum (e.g. elements of an intelligent network). These service providers would then be able to offer 3G services to customers without actually operating the radio networks. The regulator suggests 3G licensees to open 30-50% of the network to MVNOs. Almost all incumbent operators expressed their concern about MVNO. The major concern lies in the potential technical and financial difficulties for physical network operators to meet this requirement. It was argued that opening the networks to all competitors is technically inefficient for the network operators to rollout and maintain networks with an unknown requirement, in terms of capacity just for the purpose of offering it to service providers. The business viability of the network operators would be jeopardised. The incumbent also argued that the future 3G value chain would allow customers to access service and content providers. The need for MVNO might not even exist. Some analysts argue that opening the network to MVNOs is akin to permitting “free riders”. As a result, some investors may not join the bidding for 3G licenses; however, once the risk is undertaken by initial spectrum bidders and 3G is proven to be successful, they would apply for a MVNO license and begin providing services. This scenario is seen as patently unfair to the 3G licensees. Supporters of the open network requirement stressed the importance of non-discretionary access to networks by MVNOs and minimising collusion among big players who were both network operators and service providers. One submission suggested that as many as 20 MVNOs might be licensed by way of auction, enabling a large number of companies in different domains to enter the 3G services market. Successful bidders must open at least 30% of their 3G network capacity for use by non-affiliated companies to operate as MVNOs and/or content providers. More capacity could be opened up if they wish to do so by commercial agreement. However, to preserve the commercial incentive of 3G network operators to develop their networks, the regulator would not intervene for a MVNO or content provider if that operator/provider already had access to capacity equivalent to 30% capacity of a network operator. The wholesale prices for MVNOs’ access should be negotiated commercially with the 3G licensees. However, if commercial negotiation fails, the regulator reserves the right to make a determination based on fair interconnection principles. A sufficient return on cost of capital will be allowed, reflecting the higher risk of 3G service investment, when the regulator makes the determination to ensure that the investment incentives are preserved. Content providers will buy capacity at tariffs set by the 3G licensee, reflecting all relevant costs and the above-mentioned cost of capital. The regulator would only intervene in cases of unfair, discriminatory treatment or on anti-competitive grounds. Measurement by the regulator of the capacity sold to non-affiliated companies will not be necessary unless the 3G licensees refuse to supply the requested capacity. The licensee should then provide evidence to the satisfaction of the regulator that 30% of their capacity has already been opened up. The regulator is prepared to accept alternative methods of measurement proposed by operators including the simplest documentary proof of the total capacity sold, e.g. in the contracts or agreements with non-affiliated companies. In addition to the open network requirement and ensuring a level playing field for both new entrants and incumbent operators in the 3G services market, the government proposed a final requirement on certain successful 3G licensees. Those that are also 2G operators are to provide roaming to successful non-2G licensees in locations not yet covered by the latter’s 3G networks during the initial years. This mandatory requirement is crucial, because it takes time for new entrants to roll out a network with coverage comparable to that of a mature 2G network developed over many years. These new entrants are expected to have rolled out their own network and to satisfy the mandatory requirement over time. The requirement will end on a “sunset” date, intended to be five years after licences were issued. This chapter highlighted the general licensing framework of 3G services in Hong Kong. At the time this report was written (June 2001), a detailed auction method was being designed by OFTA. After the enactment of the Telecommunications (Amendment) Bill 2001, which gives the Government the legislative backing to issue the 3G licences through a hybrid selection method involving spectrum auctioning, applications will be invited. The preliminary scheduled date for actual auction is 19-21 September 2001. This study provided a comprehensive overview of the economic context of formulating 3G licensing policy in China and Hong Kong SAR. Due to differences in the underlying economic system and industrial structure, policy considerations for 3G licensing in China and Hong Kong SAR differ substantially. For China, 3G provides a golden opportunity to its mobile communications manufacturing industry. It seems that China is currently at a turning point in terms of using domestic market in exchange of foreign technology to the strategy of using domestic market in exchange of domestic industrial development. If TD-SCDMA is proven to be a feasible technology for commercial application, China might be able to repeat its achievement in fixed telecommunications system manufacturing, and the huge Chinese mobile market will create a new growth economy for China. More importantly, if TD-SCDMA dominates the Chinese mobile market – a market that covers almost a quarter of the world’s population, it is quite possible that TD-SCDMA will be diffused to other economies, including Hong Kong SAR. Therefore, the fortune of TD-SCDMA is not just relevant to Chinese manufacturing industry, but also to foreign vendors. The establishment of the TD-SCDMA forum in later 2000 is a clear sign that foreign vendors have realised the implications of the Chinese standard to their future business. 3G implies an opportunity for China, but imposes some challenges on Hong Kong SAR. Due to limited spectrum, it is unclear whether the current competitive 2G market can be successfully transferred to a competitive 3G market in the future. Also, OFTA’s traditional licensing and regulatory scheme for 2G services has also been threatened by the economic and technical constraints of 3G services. Whether or not the innovative 3G licensing framework and open network requirement of the Government will be successful remains to be seen. 3G mobile is not just an innovative technology and service, but it also brings about new economic and regulatory dynamics. It seems difficult to formulate a harmonised regulatory framework, because economies with different economic considerations might focus on different aspects of 3G development, like we have seen with China and Hong Kong SAR. Nevertheless, the common objective remains to derive the maximum benefit for the overall economy. Due to the exclusive franchise of CWHKT, Hong Kong SAR was not committed to liberalise Hong Kong’s IDD market before 2006 in its WTO agreement. In March 2000, China Unicom and China Telecom triggered a round of price war over mobile service in Guangdong and Chongqing, offering discounted connection fee and tariffs below the rate set by the regulator. In Guangdong, the Bureau of Price Administration intervened immediate blaming the operators of breaking the state price policy while in Chongqing the MII reaffirmed its stand and both companies withdrew their promotion. Chan, J. C. (2000) Regulation of Telecom Resource, Training handbook of Telecommunications Regulation, Ministry of Information Industry: Beijing, December. Ministry of Information Industry (1999) The Development of Chinese Telecommunications Industry: from 1949 to 1999.